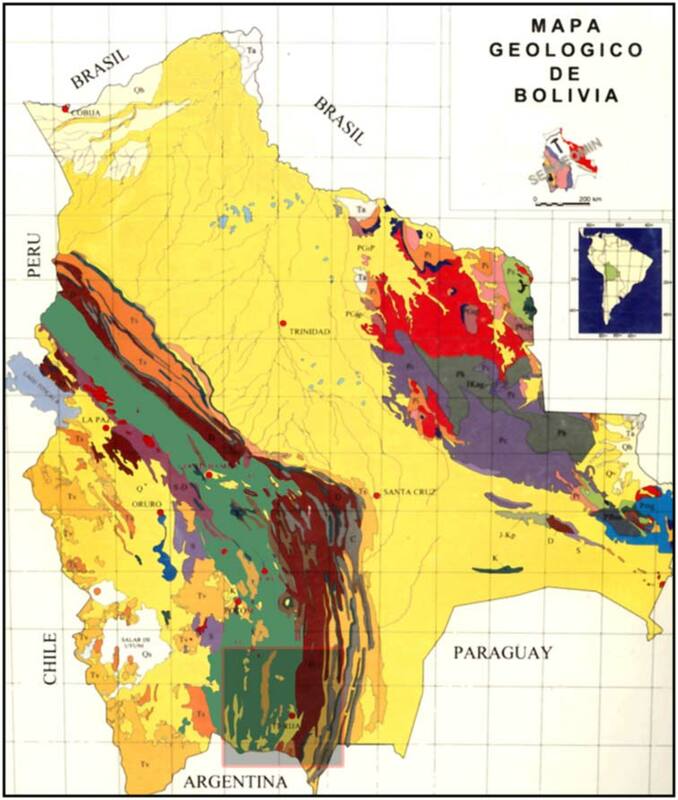 Most of the Eastern Cordillera of Southern Bolivia is built of siliciclastic sedimentary rocks of the Ordovician period (It is actually the thickest, most continuous, and probably best exposed Ordovician sequence in the world with a compacted thicknesses up to 12,000 meters). 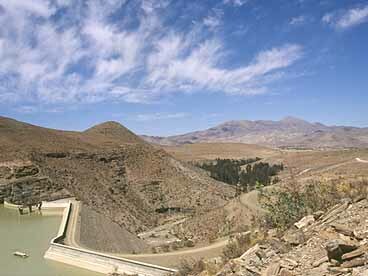 However, in the Potosi basin, up to 2,500 m thick, red, deltaic, fluvial, and lacustrine deposits of the Cretaceous-Paleogene Puca Group (esp. 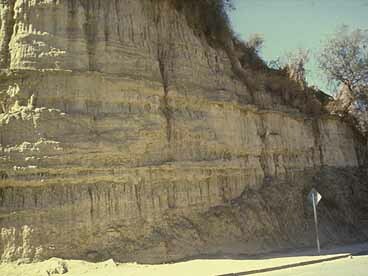 El Molino Formation) are disconformably overlying the Lower Paleozoic rocks (at Camargo the deltaic, Arenigian Pircancha Formation). This images shows the "red cliffs" in the small town of Camargo (Provincia Nor Cinti, Dpto. 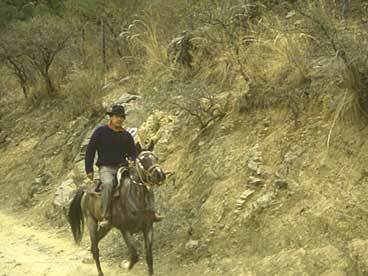 de Chuquisaca). 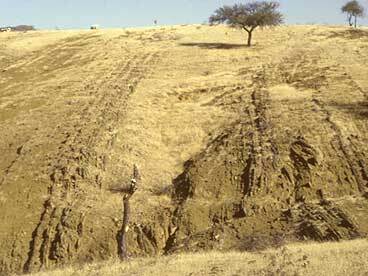 It forms part of the "Camargo Syncline", a structural element, that is to the W bound by the high-angle Camargo-Tojo thrust fault. Another view of the Camargo Syncline with the red beds of the El Molino / Santa Lucia Formations. 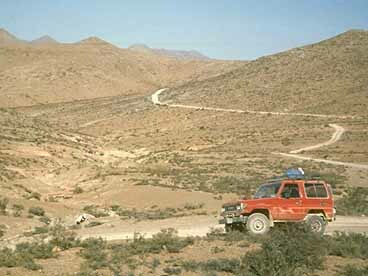 The Cretaceous-Tertiary boundary must be somewhere in the succession, but could not be identified so far. Nevertheless, if preserved anywhere, yielding evidence of the KT bolide impact, it would be one of the rare KT localities observed in S-America. On the road up to Culpina (Provincia Sud Cinti, Dpto. 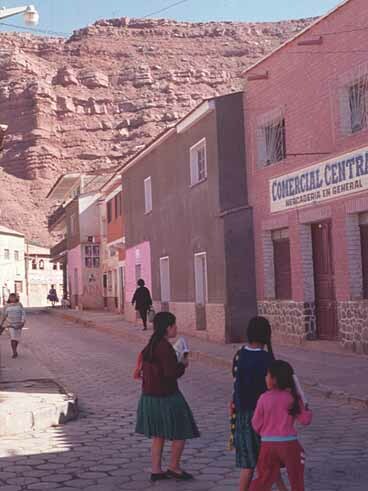 Chuquisaca), a small indigeneous town with marketplace. the road is following the gently dipping Cretaceous rocks and then crossing the angular disconformity with the Ordovician rocks underlying the Cenozoic terrestrial deposits. View across the Culpina reservoir (financed by the German development bank KfW) towards the town and intramontaneous plain of Culpina. 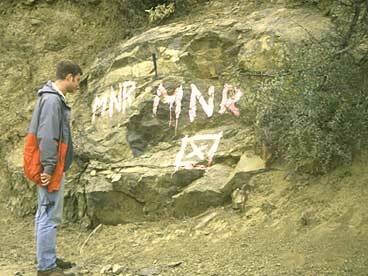 The reservoir was built within Lower Ordovician deeper marine rocks of the upper Obispo Formation (lower Arenigian). 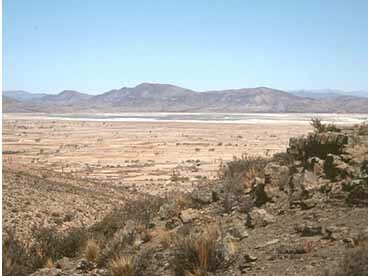 The 3,000 meter high plain of the intramontaneous Culpina basin with the saline Culpina lake (salar). 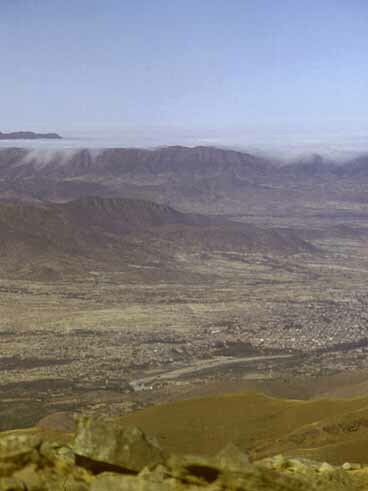 The Culpina valley produces more then 80 % of Bolivias market of the "pink onion" (cebolla rosada). 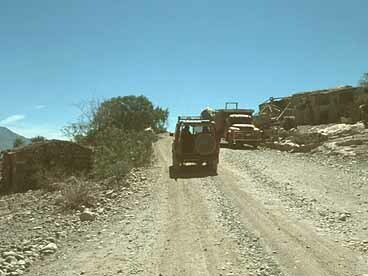 Unpaved road to the Santa Elena village, N' of Culpina. 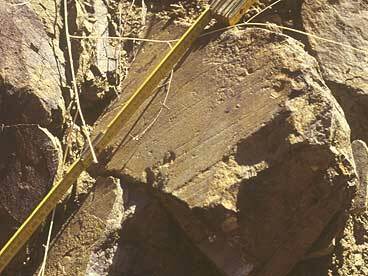 Note that the fine-grained, turbiditic sandstones, siltstones and mudstones of the Obispo Formation do not mark a significant relief. Slump-structures within siltstones indicate resedimentation events within a relatively quiet, deeper shelf environment (turbiditic ramp), which was probably structured by a submarine Horst and Graben system on a passive rift-margin. 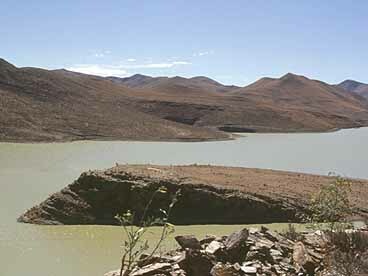 Again the Culpina reservoir with a small island, built of gently dipping silt-, and mudstones of the Obispo Formation. Note the scarcity of intercalated sandstone bodies (turbidites). Most of the rocks where deposited by suspension. 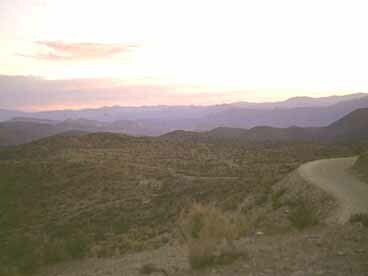 Back on the road towards Camargo, looking westward to the Camargo Syncline. 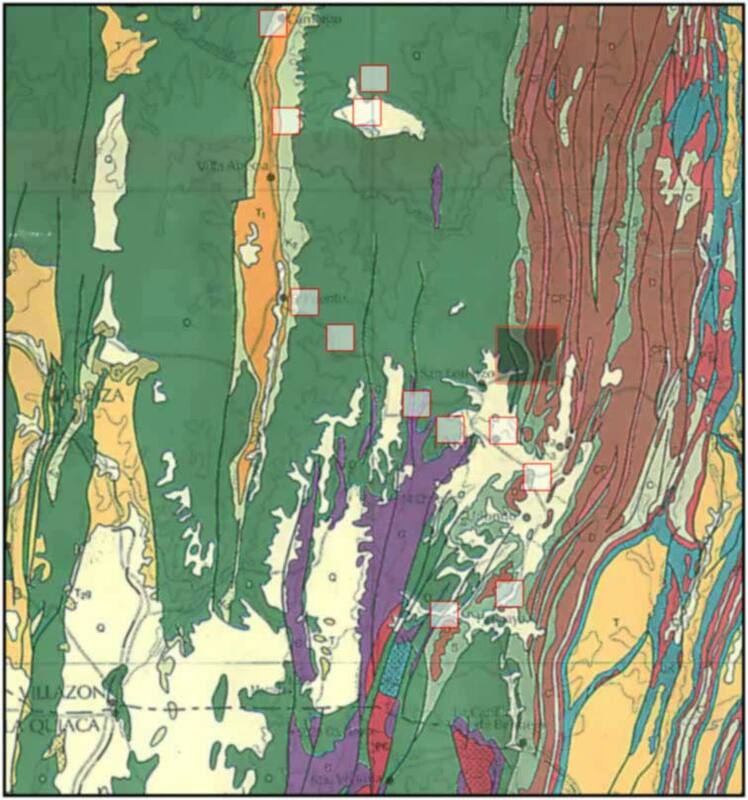 The lower part of the Cretaceous sequence is represented by sandstones of the fluvio-deltaic Torotoro Formation and limestones, marls, mud- and sandstones of the shallow-marine El Molino Formation. 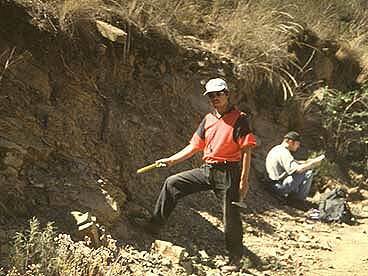 Collecting graptolites from within silt- and mudstones of the deltaic Arenigian Pircancha Formation near Chaupiuno (Provincia Mendéz, Dpto. Tarija), along the road Camargo-Tarija. The Pircancha Fm. is the lateral equivalente of the lower Arenigian Sella and Rumi Orkho Formations underlying the Cancañiri tillites near Sella. 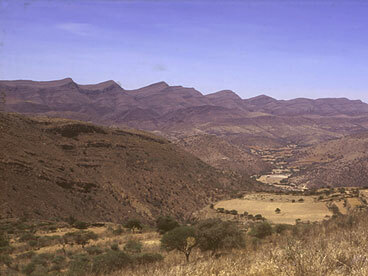 Panoramic view over hills near Cieneguillas (Provincia Mendéz, Dpto. 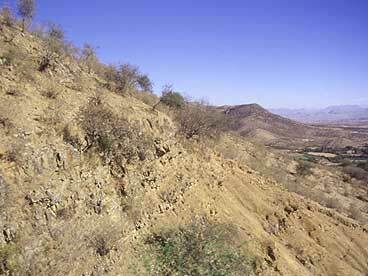 de Tarija) across the fine-grained, Lower Ordovician rocks. 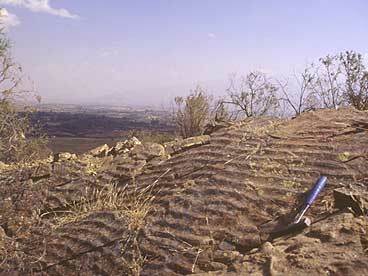 Morphologic ridges are formed by sandstone intercalations. 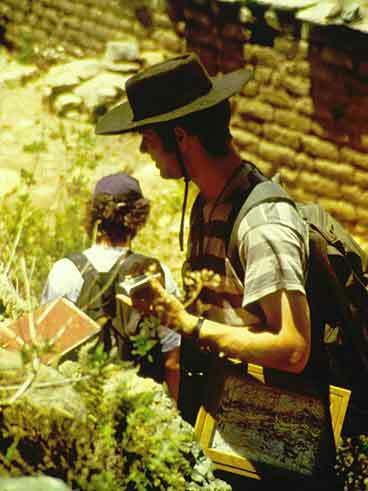 Again searching for fossils within the basal-Ordovician (Tremadocian) mudstones of the lower Obispo (Cieneguillas) Formation, near Cieneguillas. 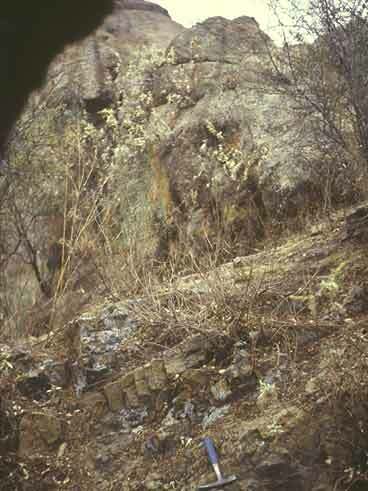 View of the same outcrop towards its base. 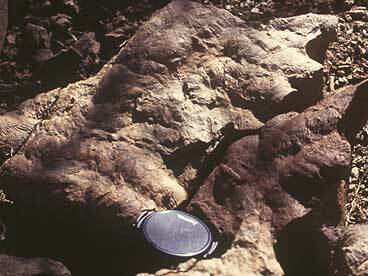 Mudstones contain the lowermost Ordovician (lower Tremadocian) graptolite Rhabdinopora flabelliformis. 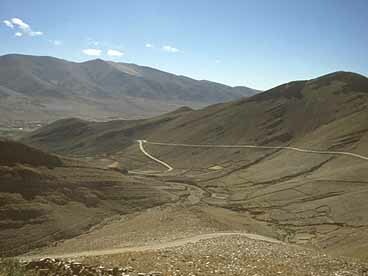 Look from the Sama pass to the W, which is bounding the Tarija basin to the NW. 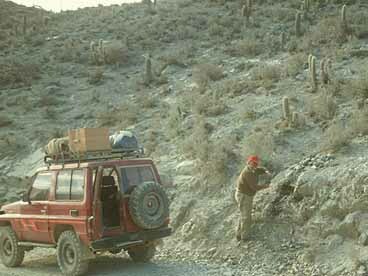 The rocks exposed along the Tarija-Potosi road down to the next crossroad at Iscayachi (Provincia Méndez; Dpto. Tarija) belong to the lowermost Ordovician Iscayachi Formation that represent a deltaic and siliciclastic coast sequence (prodelta deposits and submarine dunes). 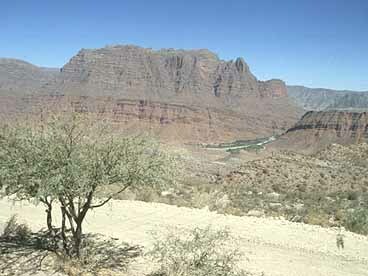 Atop the Sama Pass: close to the base of the Pircancha Formation occur sandstones with abundant lower Tremadocian agnostid trilobites. 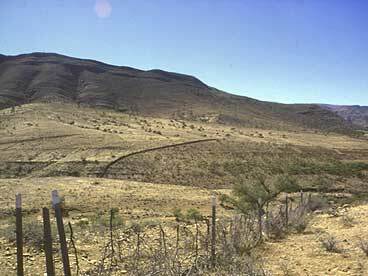 The Cambrian/Ordovician boundary, therefore, is either situated directly at the lithological contact or in the uppermost Sama Formation. 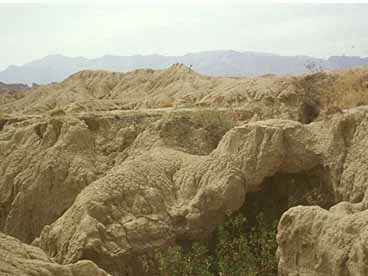 The Sama ridge itselfes, on the western flank of the Tarija basin, is nearly completely built of the massive, Cambrian quartzites of the Sama Formation with only minor pelitic intercalations. 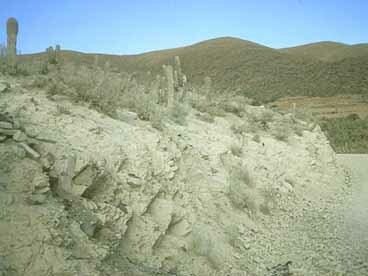 The sharp contact with the finegrained Pircancha Formation is visibly near the Sama-Tarija road. The ridge in the background is the Santa Cruz Loma, built of the lower Ordovician Sella and Rumi Orkho Formations. 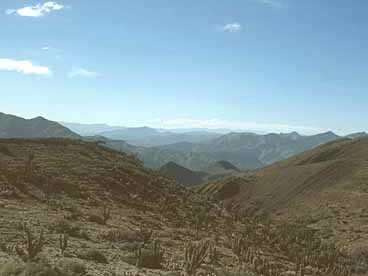 View from the Sama Pass over the intramontaneous Tarija basin. 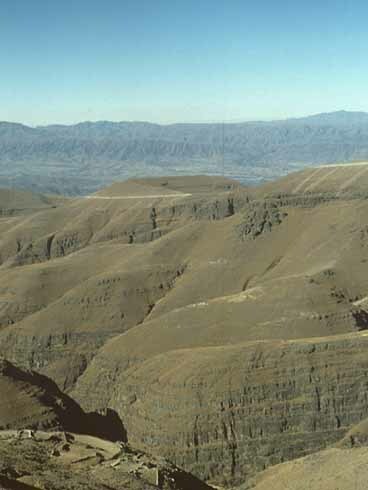 The rocks in the foreground belong to the basal Iscayachi Fm., the hills below are built of the Sama quartzites, the first ridge again of the lower Ordovician Sella and Rumi Orkho Formations, and the ridges on the eastern flank of Silurian/Devonian sequences. 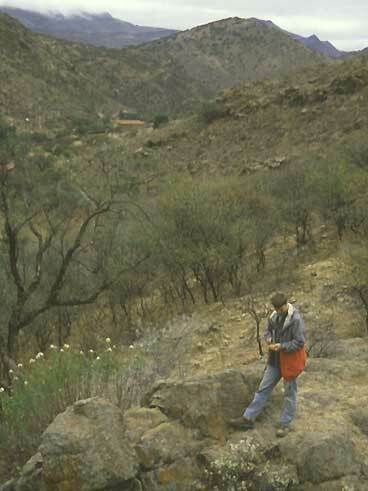 The Tarija basin itselfes is filled with Neogene, poorly consolidated fluvial and lacustrine deposits of the Tolomosa Formation, that yielded famous mammal fossil findings (see Museum of Paleontology in Tarija). 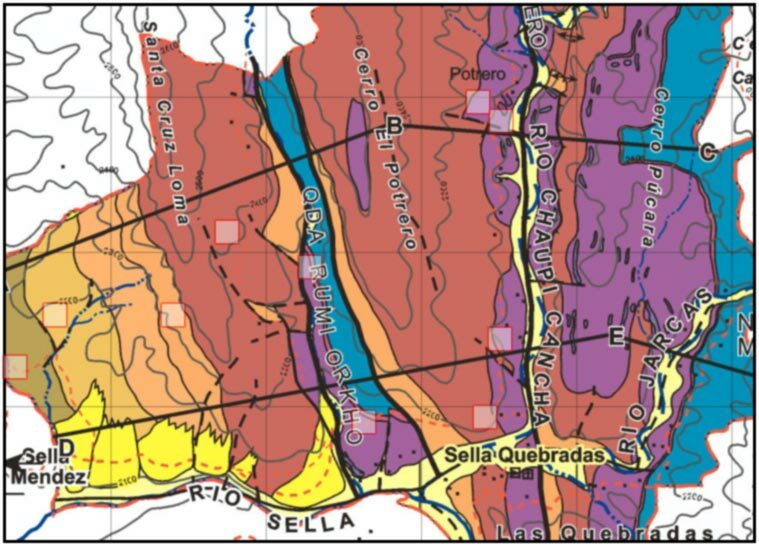 Within Tarija and along the Tarija-San Lorenzo road the Tolomosa Formation is overlying with a sharp angular unconformity the lower Arenigian Sella Formation, well exposed near the village of Sella. View across a fluvial terrace of conglomerates and sandstones of the Tolomosa Formation near Sella, towards the western flank of the basin, the Sama ridge. 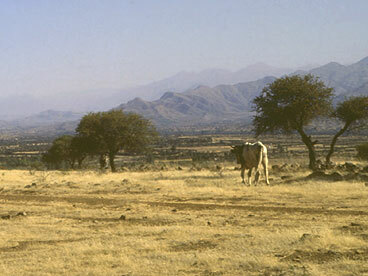 View across the southern Tarija basin towards the subandean ranges, that are built of the Devonian Santa Rosa and Gamoneda Formations and permo-carboniferous rocks. 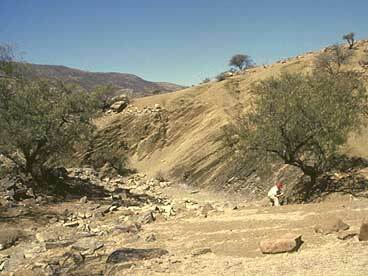 The dry bed of the Rio Orosa near Padcaya (Provincia Arce, Dpto. 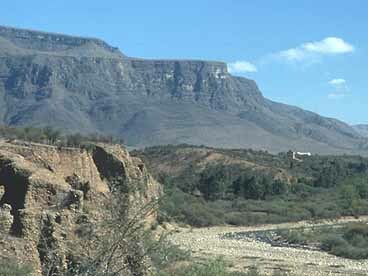 de Tarija), approximately 50 km south of Tarija with the Silurian-Devonian Subandean ridges (here: Abra Cruz Loma) in the background. 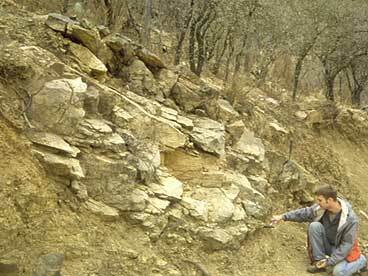 Latest Ordovician glacial deposits are found at the foot of the mountain range, but are poorly exposed. 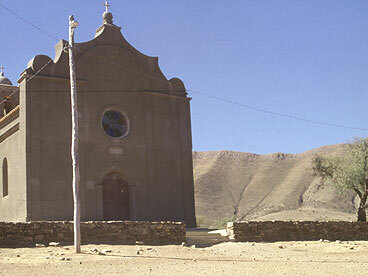 The pilgrimage site of Chaguaya (for the Virgin of Chaguaya), 60 km south of Tarija, is situated within the Rio Rosillas valley. 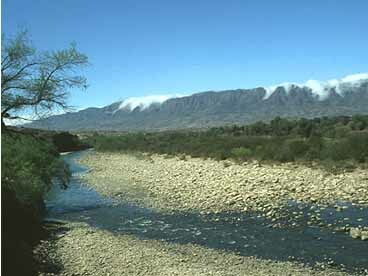 The ridges in the background are built of the Cambrian Sama quartzites and are the southern continuation of the Sama ridge near Tarija that extend to the Santa Victoria range in northwestern Argentina. The 'Santa Cruz Loma' seen from the Jaricas Valley, composed of Lower Ordovician shallow marine deposits (Sella Fm.) and topped by quartzitic sandstones of the Rumi Orkho Fm. The 'Member 1' of the Sella Fm., W' of the Jaricas Valley showing a succession of mudstones and siltstones with slump-structures. 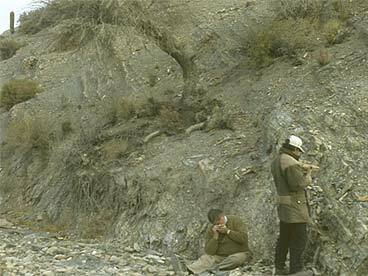 The classical 'Sella locality' of fossiliferous mud- and siltstones in the Jaricas Valley, within the 'Member 2' of the Sella Fm., yielding abundant trilobites, brachiopods, and graptolites. Cefalon and part of the thorax of a trilobite. 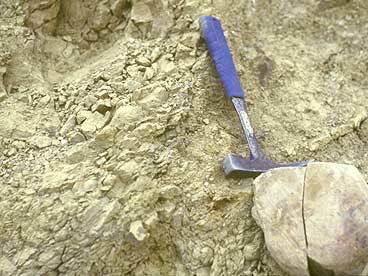 Trilobites found at the Sella locality comprise Lower Ordovician (Arenigian) forms as Megalaspidella kayseri and Kayseraspis cf. asaphelloides. N-S trending asymmetric wave ripples atop a sandstone interbed in 'Member 3' of the Sella Fm., indicating a coastline somewhere to the E.
Planolites-like trace fossils on a lower face of a fossiliferous sandstone interbed. Indicative for a shallow marine environment. 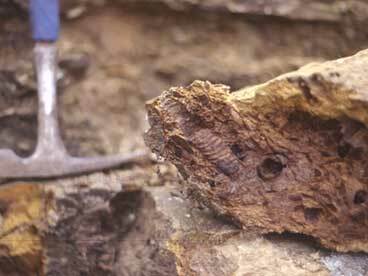 Fossil-rich storm-bed (tempestite) within 'Member 4' containing orthocone cefalopods (Protocycloceras). Such evidence of frequent storm events is abundant in members 2 and 3 of the Sella Fm. 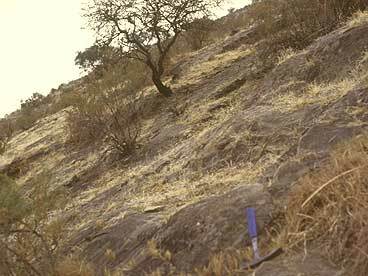 Flute-casts at the interface between mudstones and fine sandstones in 'Member 4' confirming a flow from E to W.
In the upper 'Member 4', which forms the hill-slope of the Santa Cruz Loma, the amount of sandstone beds increase in relation to mudstones. View from the Sella church towards the Santa Cruz Loma, displaying the sharp hill-cresp that is formed by here laterally continuous quartzitic sandstones of the Rumi Orkho Fm. 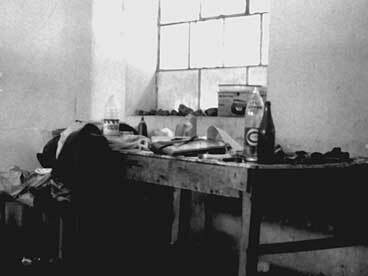 (Quechua: Rumi Orkho = Mountain of Rock). On the back-side of the hill-chain strata dip slope-parallel, unravelling an extraordinarily well preserved surface of shallow-marine hummocky cross stratification (HCS) with superimposed wave ripples within the Rumi Orkho Fm..
Ichnofossils, believed to be traces of trilobites, are abundant within the sandstones. The ichnogenus Cruziana was first described by d'Orbigny (1842) from the Cochabamba area in his 'Voyages dans l'Amerique meridionale' and named in honor of the former Bolivian president Mariscal Santa Cruz. View from the Rumi Orkho Valley, tracing a thrust fault, to the SE. 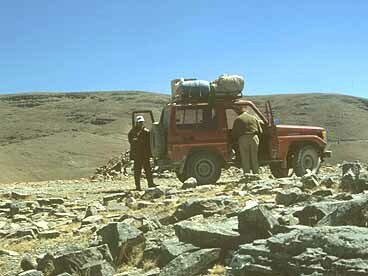 To the left the, here barren-like, sandstones of the Rumi Orkho Fm. 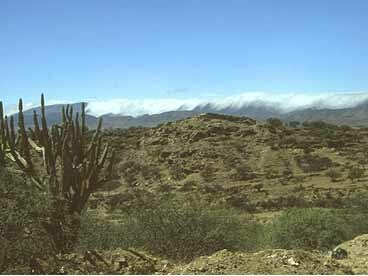 The lighter stripe on the hillslopes in the background is the Cancañiri Fm. Mario and I close to the contact between the Rumi Orkho Fm. and the unconformably overlying diamictites at the entrance of the Chaupi Cancha Valley. The contact is poorly exposed. A striated, parautochthonous block of the Rumi Orkho quartzites at the base of the diamictites. Evidence for erosive nature of the overriding ice masses. 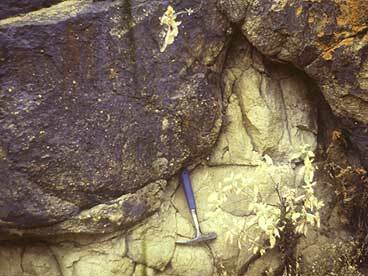 Heavily weathered granite clast. Such clasts have been eroded from crystalline basement area, most likely in mountains, and travelled over large distances within the ice. 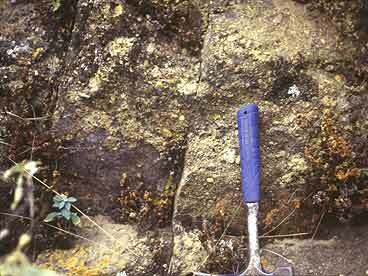 Large quartzite boulder within the unsorted, non-stratified deposits. 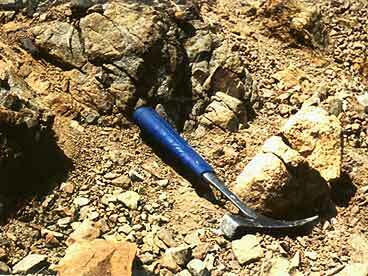 This 'clast' is as well not derived from the Ordovician sediments, immediately underlying the tillites. Measuring interbeds of well stratified quartzitic sandstones that are interpreted as glacial outwash deposits. 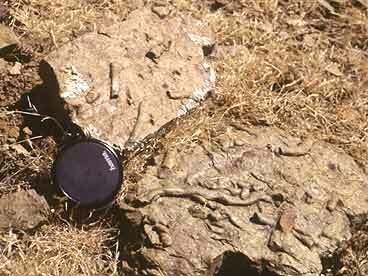 Lens of massive siltstone, thought of having been formed under low energetic conditions within an subglacial pond. Vertical ice wedges within the upper part of the lower member of the Cancañiri Fm. representing a time of periglacial conditions prior to the second ice advance. Striated 'stoss-lee' clast of fine sandstone, confirmig glacial abrasion within the basal zone of traction of a glacier. 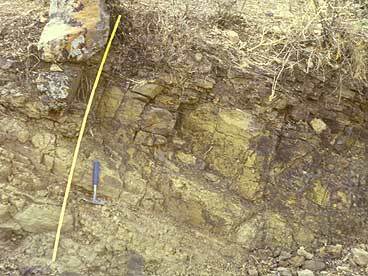 Most of the clasts within the diamictites show glacial abrasion features. Lenticular body of laminated, well sorted, quartzitic sandstone with sharp contacts to the confining diamictites. 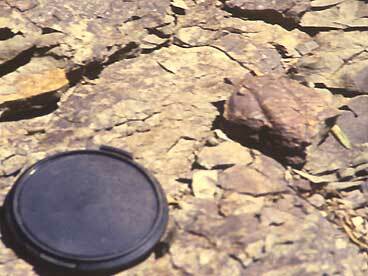 Such lenses are abundant in the lower part of the succession and interpreted at subglacial outwash channels. 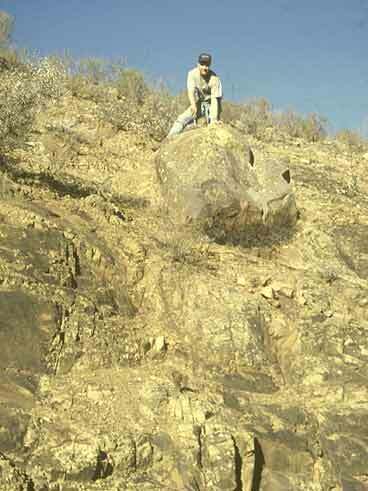 Atop a local, but thick, body of medium conglomerate in the upper part of the Lower member of the formation. These conglomerates represent supra- or proglacial outwash. The same conglomerate seen from the side. It overlies stratified and non-stratified diamictites. 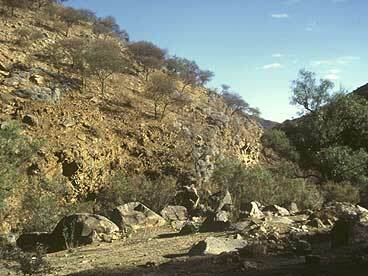 In the background (upper left) the upper formation and the contact with the Silurian ironstones at the Pucara Mountain. 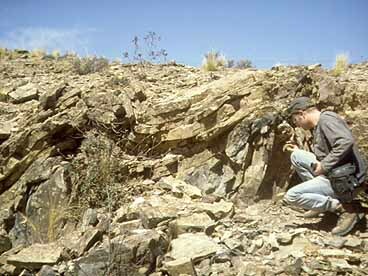 The conglomerate is directly underlain by a fine-grained, unstratified diamictite which was deformed and diapircally squeezed in to the coarse deposit. Deformation is from SE to NW and probably caused by the overriding second ice advance. Detail of the conglomerate, which exhibits a crude cross stratification and is not very well sorted. Energies within the glacifluvial stream were relatively low. Upper contact to the Kirusillas Formation within the Rumi Orkho Valley with ferriferous iron-sandstone at its base, overlain by silt- and sandstones. Within the valley there is an inverse fault. 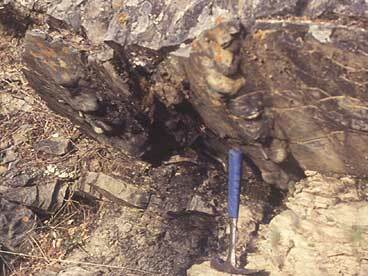 The uppermost diamictites just below the ironstones (right) are stratified and internally laminated. The represent a phase of subaerial expusure and resedimentation in a brackish to intertidal environment. 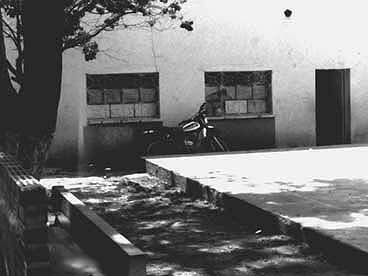 Accomodation within an abandoned class room of the local school in Sella Mendez. Working desk in the relatively empty class room.